With this module you can play custom sounds at a specific location on your layout or connect to your overall amplifier and speaker system. You can schedule these sounds to be played automatically or under manual control. You can generate the sound of a locomotive, railroad crossing, an industry, a farm, mine, village or other layout feature. You can link automatic playing to a locomotive via the Loco Operator app, to a fast clock, or to loco occupation via our Tower Operator App. The module provides four independent sound output channels mixed and supplied to a single speaker or via line-out to your own layout speaker system. You can install one or more of our sound packs or create your own sound packs using our free Sound Manager Windows Application. You can install any number of Sound Packs and cause up to four sounds to play at the same time. You can install this module at a region of your layout to generate sounds to be played automatically or under manual control. You can generate the sound of a locomotive, an industry, a farm, mine, village or other layout feature. You can create your own sound packs from any set of .wav files or install a WifiTrax Sound Pack. The WFA-10 implements a concept of Sound Bites. These are short sounds that can be played once or in a continuous repeating manner. The sound bites can be scheduled to play under certain circumstances such as time of day (fast clock), the speed and acceleration of a specific locomotive or when sent a specific manual signal. 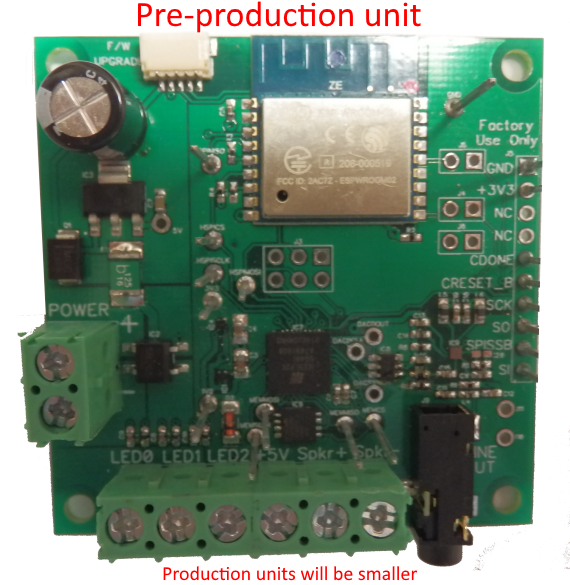 For example, if you have a WifiTrax loco that is not equiped with sound or you are driving a DC locomotive (using Wi-Fi DC) you can use this module to output its sounds. Alternatively you can use the WFA-10 to output sounds representing an railroad crossing, industry, farm, village, clock tower, faiground - use your imagination! Line output to your amplifier and speakers. Flash Memory to hold digitized sounds. Custom WifiTrax Sound Controller Chip to control output of 4 channels of sound. WFA-10 Wi-Fi Layout Sound Source. Preliminary Specifications - subject to change prior to final release. Installs on your layout to provide direct Wi-Fi controlled output of sounds. Sounds may be downloaded from .wav files using WifiTrax Sound Manager Windows application. Sound manager processes files as required by WFA-10. Sounds are in the form of "Sound Packs" containing sound bites and sound schedules. Sound schedules determine when and how sounds will be played, which of four channels and at what volume. Schedules have activators that detect values of signal variable Wi-Fi inputs. Unit receives inputs of signal variables over Wi-Fi from other WifiTrax apps such as Loco Operator. HTTP Server, receives Get and Post requests from app. Sends and receives JSON data. See technical interface reference to be made available. Sound Bite Storage: 8 MByte Flash Memory. Sample Rate: 14.7 KHz. Mono. Maximum Single Sound Bite Length: 4.75 Minutes. Maximum Total Sound Bite Length: 4.75 Minutes. Speaker Output Power: 2 Watt. 12 to 18 Volts DC independent power, wired to screw terminals on unit. This unit does not operate using AC. Power supplied from NMRA Compatible DCC Booster may be used as alternative to DC. Typical inactive current consumption: 90mA. Four M3 mounting holes for use with screws, nuts and spacers, or suitable wood screws with spacers. Screw Terminal Speaker Connections - 8 Ohm or 4 Ohm speaker. LED Cathode Outputs - 3 Connections. +5V Common LED Anode. DC Power Input 12 - 18 Volts.